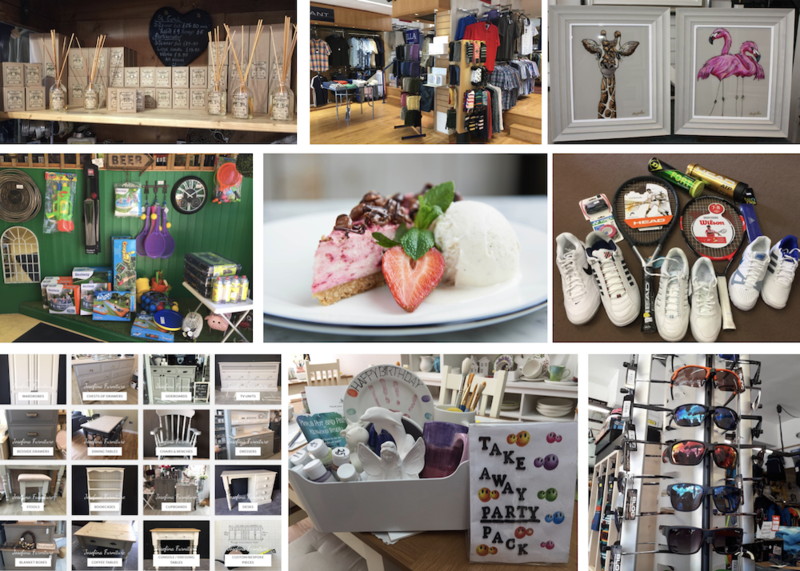 Check out news from Uckfield shops in this feature and see tips for what you can find where during July. Carvills summer sale starts on Thursday, July 12, and sale items include bed linen, towels, pictures, lamps and giftware. You will also find up to 20% off all fabrics and wallpaper orders during the sale. New in at the store is the latest collection of characters from Jellycat, including Smudge Elephant, Dancing Darcy, Larry Lobster and many more of their furry friends. New Jellycat characters at Carvills. W E Clark & Son jewellers are offering people the chance to win a Jersey Pearl Bracelet worth £65. The rose gold plated on sterling silver bracelet, which can be easily adjusted to fit, is part of Jersey Pearl’s new Coast collection. You are welcome to call in at the store to look at the bracelet from Saturday, July 7, to Saturday, July 21. The jewellers will run the promotion on their Facebook page so it is worth keeping an eye out for the post. The Jersey Pearl bracelet being offered as a prize in a W E Clark and Son Facebook competition. The sale section at Chapter Three is constantly being replenished as new stock is filtered into the shop so it is worth calling in regularly to see what is available. New in is Parkminster a range of votifs, candles and diffusers, made in West Sussex and with 100% natural products. Parkminster a new range of votifs, candles and home fragrances at Chapter Three. Have you seen that furniture is now available online at Josefina? A portfolio is building up there to show you the joinery available and how it can be customised to suit your space and colour scheme. A sale has just finished at the High Street shop and new lines are coming in so do pop in to see what is available. Some of the furniture you will find on the Josefina website, which can be painted to suit your colour scheme and made in the size you request. Summer bedding plants and hanging baskets are still available at Staverton Nursery. The bedding have grown on now into one litre pots which are ideal for creating instant colour and filling gaps in your planting. They are £3.49 each or you can mix and match three for £10. Bedding plants in one litre pots at Staverton Nursery. Mix and match three for £10. The roses are still looking good with lots of buds to be seen and perennials are coming on. 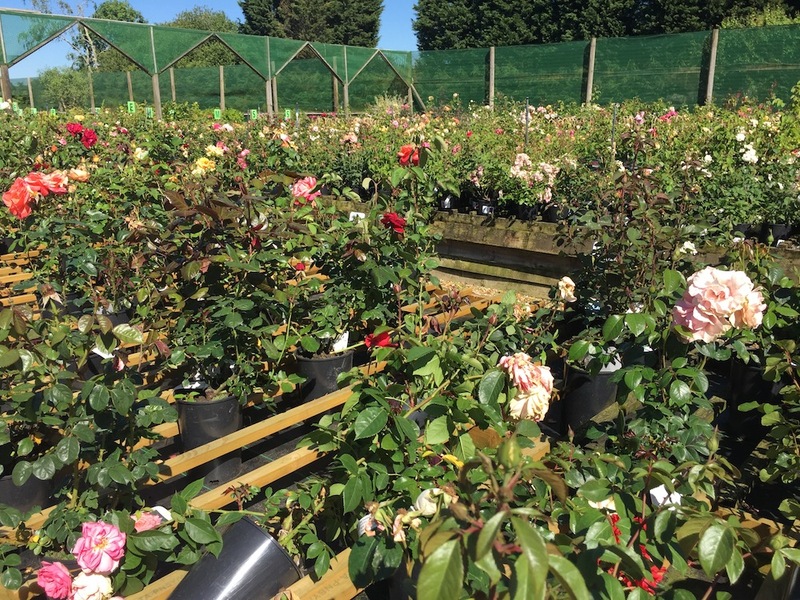 So many roses at Staverton. Plenty of buds still to be seen. Check out the garden furniture too, tables and chairs, benches, garden swings and umbrellas to shade you from the sun. 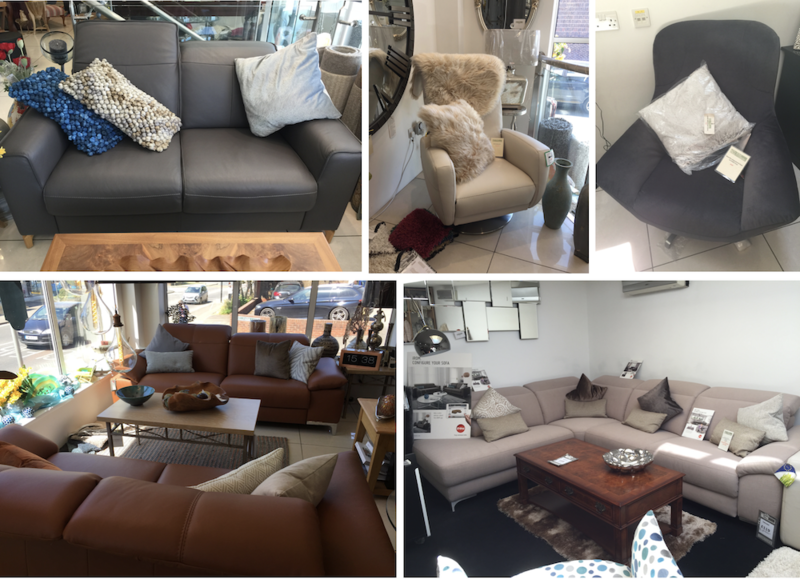 Sofas in all shapes and sizes are available at SG Home Interiors. The company can make them for you in a style and fabric of your choice and they also sell ROM sofas which again can be tailored to your needs. If you call in at the showroom in Bell Farm Lane you will be able to see the range available, choosing the style you like and then configuring it to fit your room. Head rests can be raised or lowered, recliners can be included, and you can choose the feet you like too. ROM swivel chairs are also available. ROM sofas – which can be customised to include the features you like – and swivel chairs at SG Home Interiors. Hooked on Green the fishing tackle shop next to Green DIY is giving away £90 worth of Coarse and Match gear in a Facebook competition. The competition celebrates the start of the river fishing season and all you have to do to stand a chance of winning the gear is to follow the link to the Hooked on Green Facebook post, comment ‘I’m Hooked’ and share the post. The winner will be chosen at random. The closing date for entries is Saturday, July 7. £90 worth of Coarse and Match fishing gear – the prize in a Facebook competition being run by Hooked on Green. 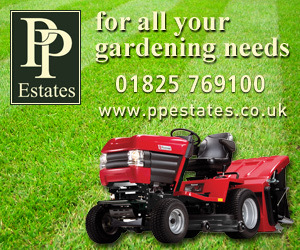 Within Green DIY there are plenty of seasonal products in stock, from barbecues, to lawnmowers and solar lighting. There is also a range of outdoor games, such as cricket sets, Frisbees and paddling pools for entertaining kids on a budget. Some of the outdoor games available at Green DIY. 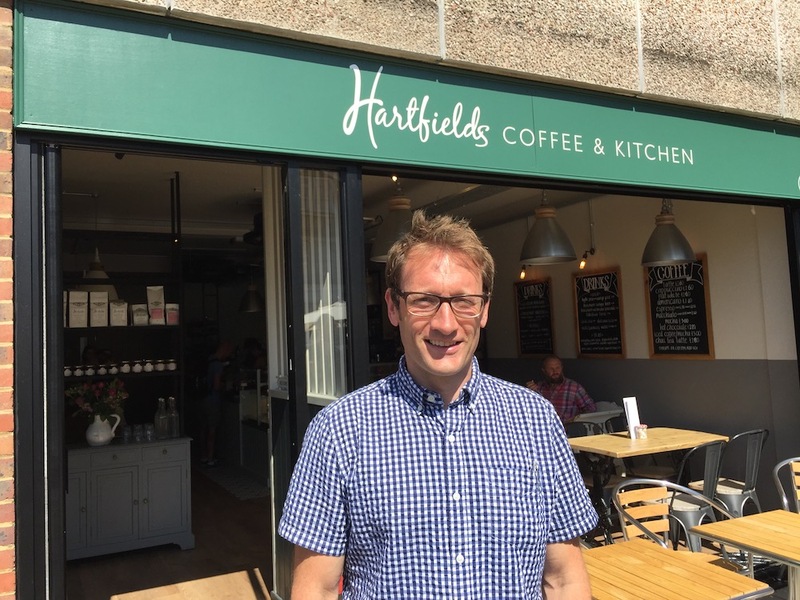 Hartfields reopened on Thursday following refurbishment and owner James Hartfield is delighted with the result. Judge for yourself here in these Uckfield News photographs: New look and more space for Hartfields as it re-opens. James Hartfield, happy with the refurbishment of his coffee shop and restaurant. Beachwear, shorts, T-shirts, pumps, short-sleeved shirts – all available at Cole’s in Uckfield High Street. 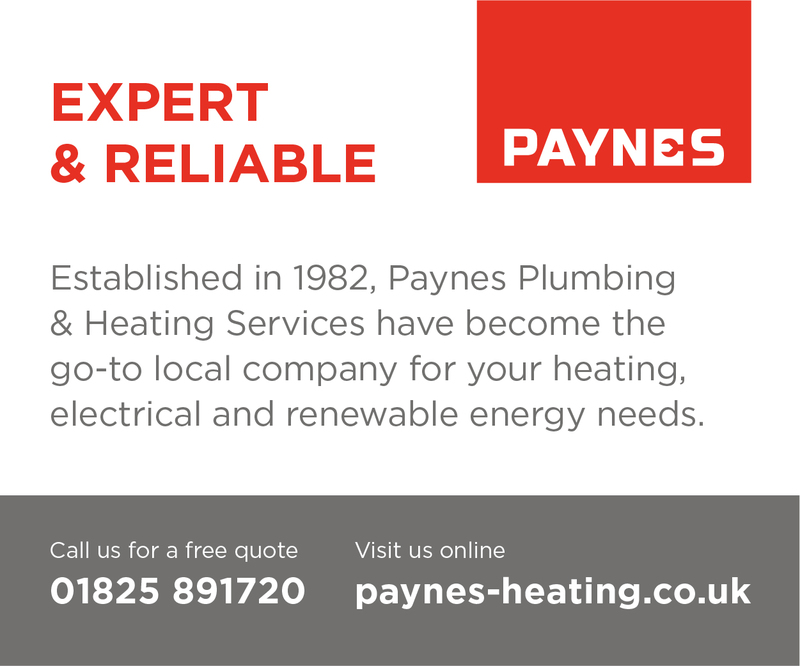 Do call in when you need to top up your wardrobe. A look inside Cole’s where there’s plenty of summer stock. 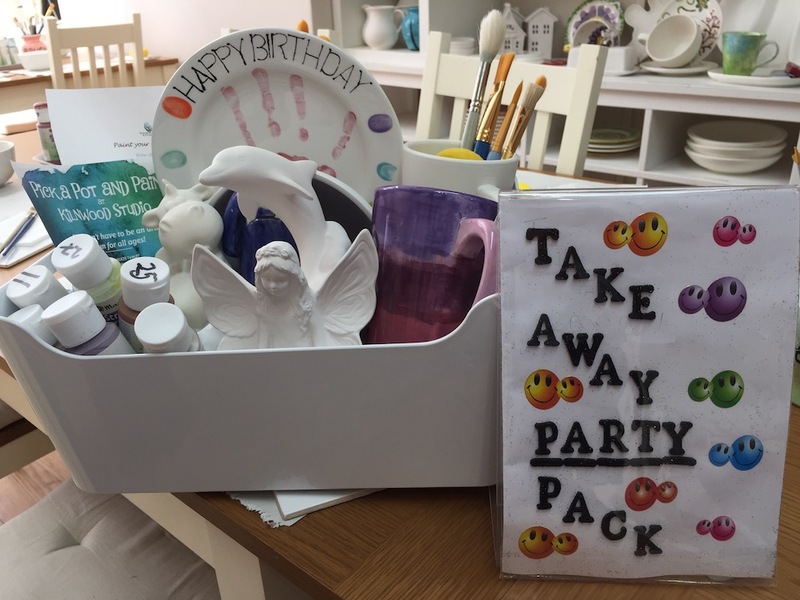 Kilnwood Studio, a popular destination for pottery painting in Uckfield, has launched takeaway parties. If you would like to do your own pottery painting at home a pack can be prepared for you – for a minimum of six party-goers. You have fun painting your chosen pieces then return them to the shop for glazing and firing. The cost for six people is about £70. It’s also worth knowing that if you would like to make a special end of year gift for a teacher a choice of pottery is available at Kilnwood Studio. Some even say ‘Best Teacher’. An example of a takeaway pottery painting party pack available at Kilnwood Studio, Uckfield. 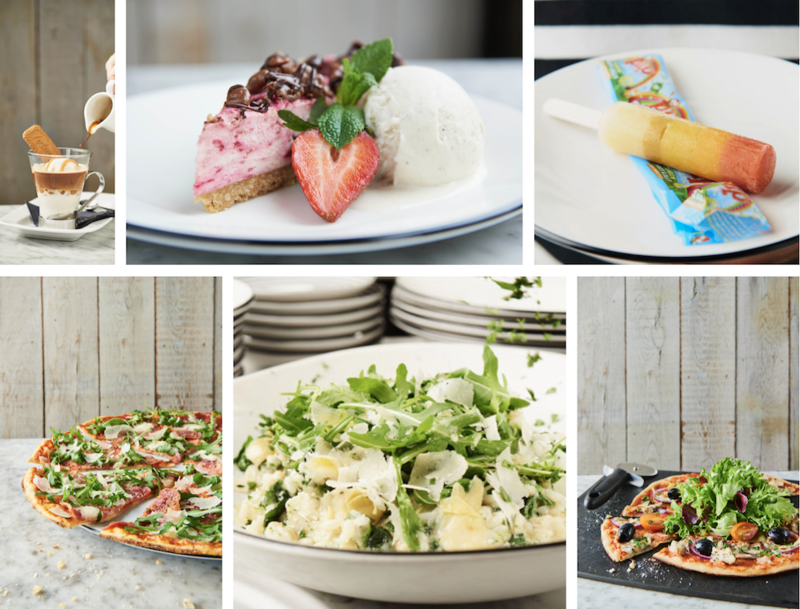 Pizza Express has launched its summer menu and is suggesting that if you’re in the mood for something new you could try the lighter Vegan Leggera Giardiniera (just under 600 calories), or savour the deep flavours of the bigger, thinner and crispier Quatro Carni Romana. Finish off with Affogato, the classic combination of a strong espresso and creamy gelato, with a dash of salted caramel sauce. On July 4, Pizza Express is running its Pizza Wednesday 2-4-1 on mains. 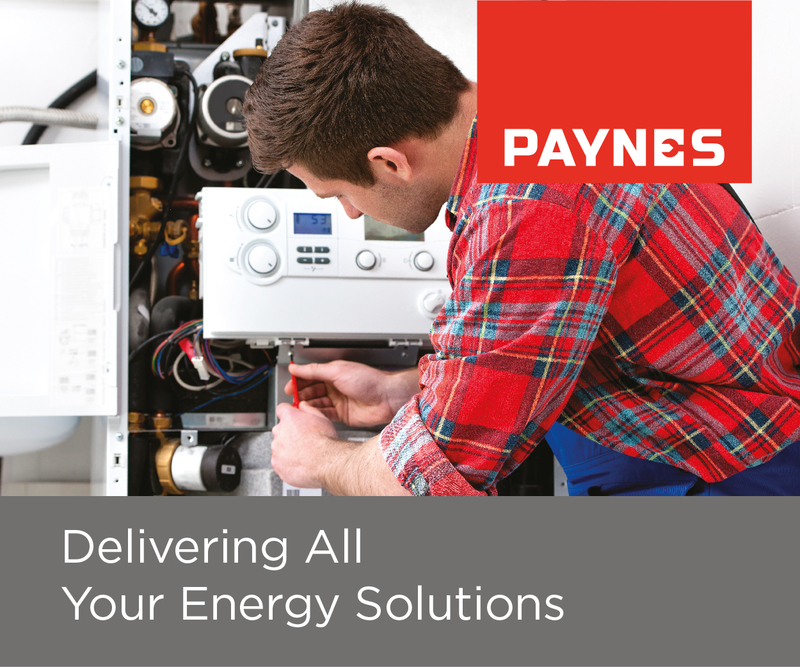 Follow this link to get more information about the 2-4-1 offer. On the summer menu at Pizza Express. New artworks have arrived at the Diane Hutt Gallery. They include a fun giraffe and flamingos from Amy Louse and a seaside meadow from Mary Shaw. 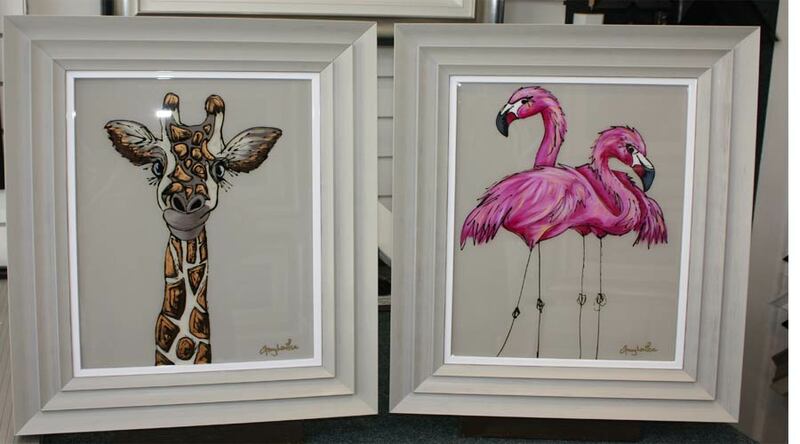 A giraffe and flamingos – two new works from Amy Louise at the Diane Hutt Gallery. 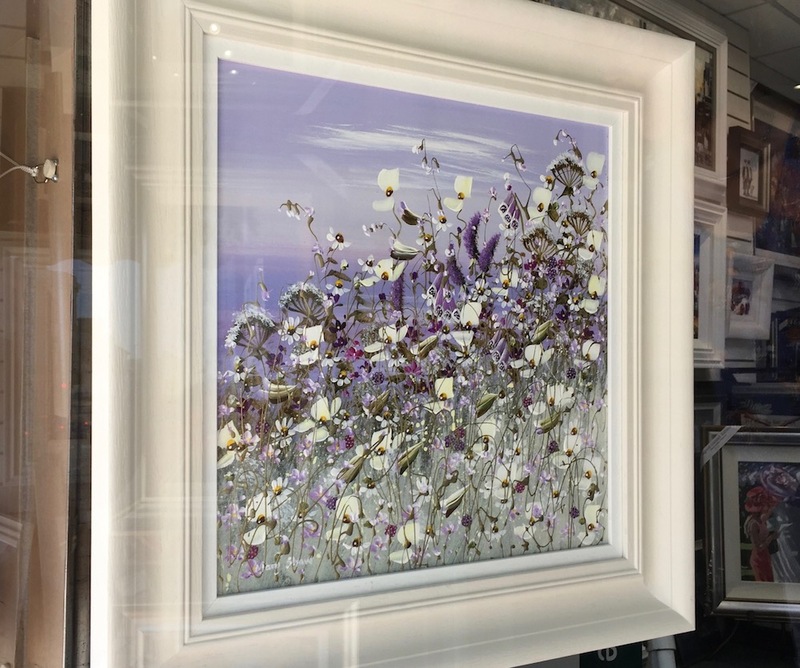 Seaside Meadow from Mary Shaw at the Diane Hutt Gallery. Bright Border from Carl Scanes. 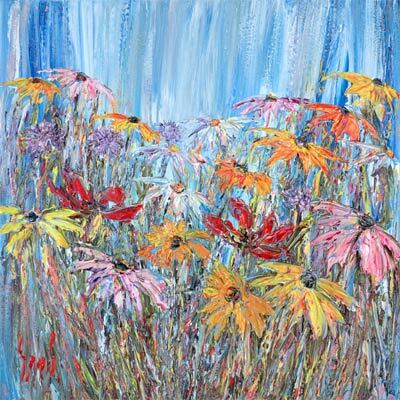 There’s also the colourful Bright Border on canvas from Carl Scanes. 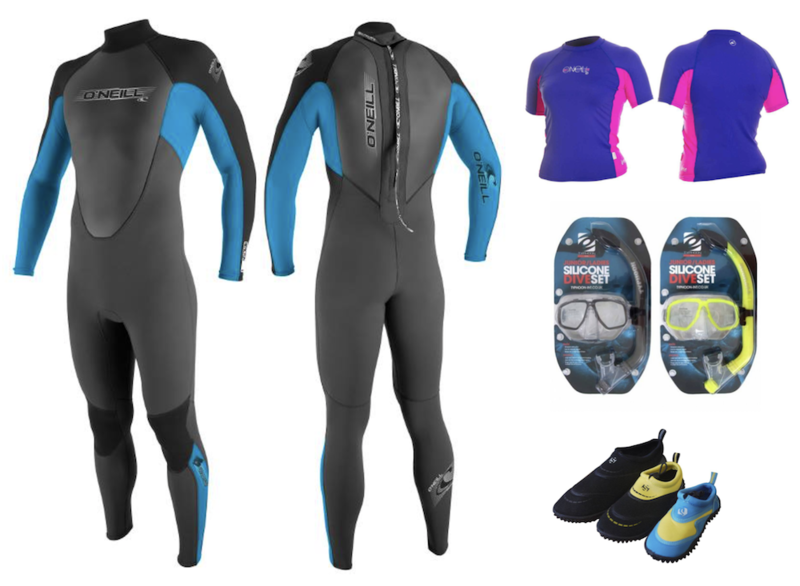 Water sports gear, wet suits, wet boots, beach shoes, bodyboards, surfboards, and buoyancy jackets, are all available at PipeDreams in Uckfield High Street. Some of the water sports gear available at PipeDreams. 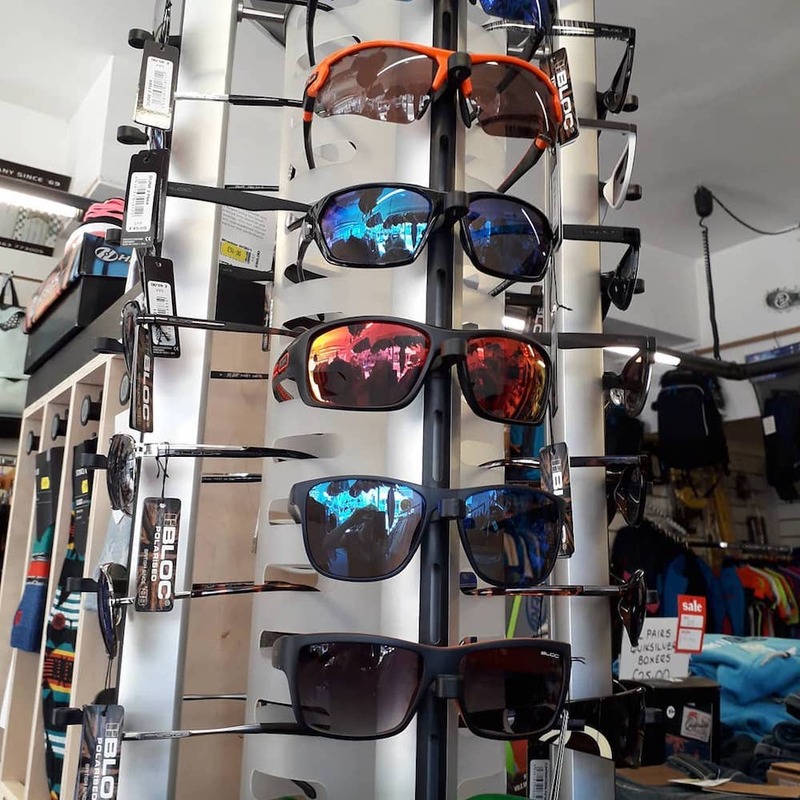 There are flip flops bikinis, board shorts, rash vests, sun hats and caps, summer clothing, and even sunglasses too, so if you are planning a holiday, or days on the water, do call in to shop in advance. Need sunglasses – here are some at PipeDreams. 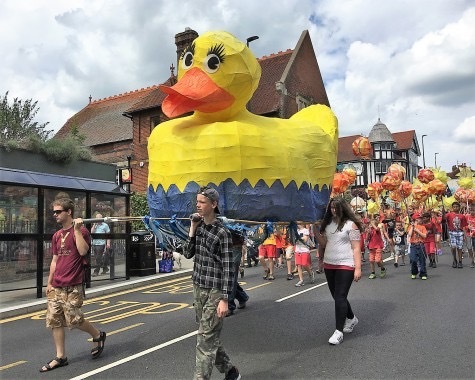 Look out for the blue and yellow colours of Uckfield Festival appearing in High Street as the town prepares for the extravaganza which runs from Saturday, July 6, to Sunday, July 15, with the Big Day and colourful parade taking place on the first Saturday. A picture from last year’s Uckfield Festival grand children’s parade. Among the shops getting involved will be the Chestnut Tree children’s hospice charity shop. Both its windows will be decorated in blue and yellow and blue and yellow clothing will be on display. The Chestnut Tree shop also has a date for your diary: Wednesday, August 1, Mad Hatters Day, when volunteer staff will be dressing up. There will be a cake sale, and raffle and all you would need for a tea party including cups and saucers and teapots. The event will celebrate the 15th birthday of the Chestnut Tree House children’s hospice. Have you spotted that free NHS health checks are available at Kamsons Pharmacy. There are drop-in sessions at the pharmacy in Bell Farm Road every Thursday from 10am-3pm, and in High Street every Friday, from 9am-5pm. Read more in a previous Uckfield News story here: Free NHS health checks at Kamsons Pharmacy. 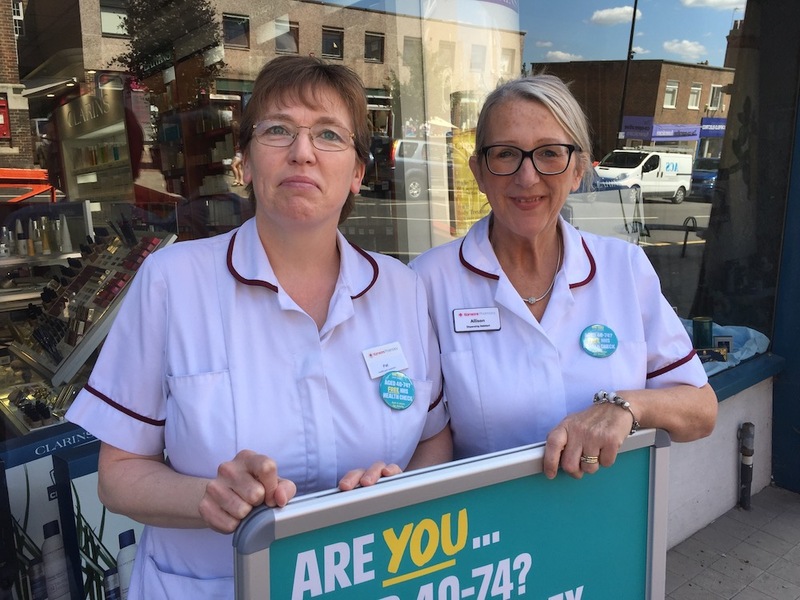 Pat Wickson and Allison De Bolla, health champions at Kamsons Pharmacy, who conduct free NHS health checks at pharmacies in Bell Farm Road, and High Street. Wimbledon is fast approaching and Final Score sports shop can supply shoes, rackets, clothing, and accessories such as grips and sweat bands for anyone – whether adult or child – wanting to get out on the court this summer. Everything you need for tennis at Final Score sports shop in Uckfield. Fluffy Side Up has welcomed completion of an upgrade to the area outside its shop and is pleased to see its neighbour Hartfields open once more. The carpet shop only opened its own doors in March and has gradually been adding displays. Now just the finishing touches are needed but the move to the High Street has been a good one, said Sacha Thompson who works there. Feel free to call in and browse the carpets and flooring available.